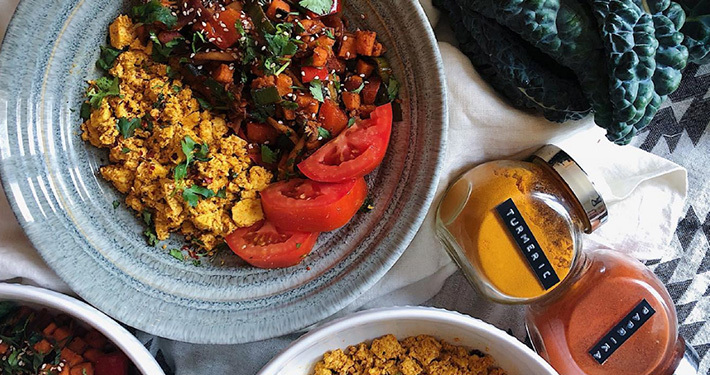 spices for tofu (to desired taste): turmeric, garlic powder, paprika, cumin, chipotle chili flakes, himalayan pink salt, pepper, nutritional yeast. spices for sweet potato/veg mix (to desired taste): garlic powder, paprika, chipotle chili flakes, himalayan pink salt, black pepper. Spray a medium sized pan with avocado oil cooking spray and put over medium-high heat. Add chopped sweet potatoes, leeks, onions and peppers. Sprinkle with desired spices and cook down. 3-5 minutes in, add mushrooms and continue cooking. While the vegetables are cooking, start the tofu. Prep the pan the same way, add tofu, and mash using a spoon or fork until the desired consistency is reached (should resemble scrambled eggs). Add spices and cook until most of the moisture is gone. Plate, add sides and toppings and enjoy!